"Couples, Start your Engines and May the Best Wedding Win!" Some girls make wonderful jivers, some girls can hit a high "C", some girls make good taxi drivers, but what a genius is Alysha Umphress when she would finally play the role of bride. For several years she had been Cody William’s ideal of a perfect meal, and she had a very clear vision of the wedding she wanted in this helluva town. When she needed a wedding planner, I said “Ya Got Me!” Okay that concludes my references of the show that was an integral part of their early dating years. After exploring several venue options, we landed at the Green Building in Brooklyn to be the canvas for stars, moons and neon. We designed a floor plan suited for this cocktail-style reception, and booked Korilla BBQ and Chick N Cone as the two food truck offerings. Celebrity chef Zac Young would provide the cake and other desserts, in addition to dole whip by Pineapple Express. We curated a bar menu featuring a take on an Aviation named “4Lysha’s Flight.” Name Glo provided the various neon signs, and we added string lights and hanging stars to the Color Condition from Patina Rentals to give the ceiling it’s texture. Dirty Sugar provided an interactive photo-booth with clouds and a giant moon. Jake Wilson curated a video of campy content and crowd favorites that projected over the dance floor. Star magnets made from recycled LaCroix cans served as the take-home favor. 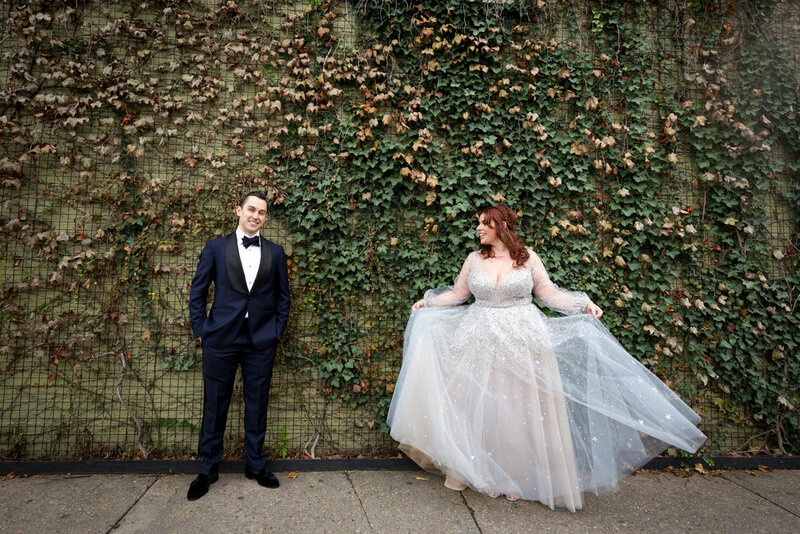 These details all came together to create the “4Lysha Look,” and luckily David Pearlman Photography was there to document it all. But it was programming of the night that caused it to truly take flight. The ceremony began with music performed by John Gallaher Jr. and Libby Winters. Then Cody entered with the flower girl, their dog Dizzy. When Alysha appeared at the back of the aisle in her silver Hailey Paige gown, she literally got entrance applause. Jeff Blumenkrantz officiated a funny and sentimental ceremony which reminded everyone in attendance that Monday on the tangibility of real love.